Thanks to New York State’s wise libel tourism laws, reviewers of this film can refer to “historian” David Irving as a holocaust denier secure in the knowledge New York courts will not honor any foreign libel judgments against them deemed inconsistent with our own First Amendment rights. One would think the ugly spectacle of Irving suing American historian Deborah Lipstadt, forcing her to prove the Holocaust happened would have created a groundswell for libel law reform, but alas, it did not. The high stakes court case gets the big screen treatment in Mick Jackson’s Denial (trailer here), which opens this Friday in New York. Irving was once a semi-credible historian, who garnered some favorable blurbs before crossing over to the dark side. By the time Lipstadt’s book Denying the Holocaust was published, he was a fringe figure, but he still had a knack for garnering media attention. In a potentially devastating act of libel tourism, Irving sued Lipstadt’s British publisher, Penguin UK, in British courts. In an American court, Irving would have to prove Lipstadt’s words were both defamatory and the product of demonstrable malice, but in Britain Lipstadt would have to prove they were justifiable. As a result, Penguin’s legal team, notably including barrister Richard Rampton QC and solicitor Anthony Julius (in/famous for representing Princess Diana), had the responsibility of proving the Holocaust really happened and Irving knowingly and deliberately twisted the historical evidence to the contrary. Mindful of the David-and-Goliath symbolism, Irving opted to represent himself in court. Again, due to the perversities of the British system, this also gave him some advantages over as Lipstadt as one of the opposing counsel. Still, the old “fool for a client” adage hasn’t remained in this long circulation for no reason. Denial is at its best when it really digs into the blow-by-blow details of the trial. Rather logically, all of the litigious Irving’s dialogue in these scenes is adapted verbatim from the transcript. Watching the crafty Rampton lure the over-confident Irving into various logical-historical traps is gripping stuff. Unfortunately, Lipstadt’s overwrought outrage almost becomes insufferable. She is an accomplished academic, but Rachel Weiss plays her like a shticky Queens caricature incapable of controlling her emotions or her mouth. When Weiss shuts up, Tom Wilkinson carries the day, portraying Rampton with all his customary panache and gravitas—and then some. He exudes the intelligence and charisma of a barrister you would want to be represented by. Similarly, as the Holocaust denier, Timothy Spall is aptly wily and sinister, in a tweedy British sort of way. Frustratingly, the terrific Irish character actor Andrew Scott (Jim Moriarty in the Cumberbatch Sherlock) does not have much to do as Julius except trying to rein in Lipstadt. When it is smart, Denial is an intense and insightful film. When it is emotional, it gets a bit dumb, which goes to show the principles for success are not that much different on film than they are in the courtroom. Fortunately, old pros like Wilkinson and Spall keep things crackling. 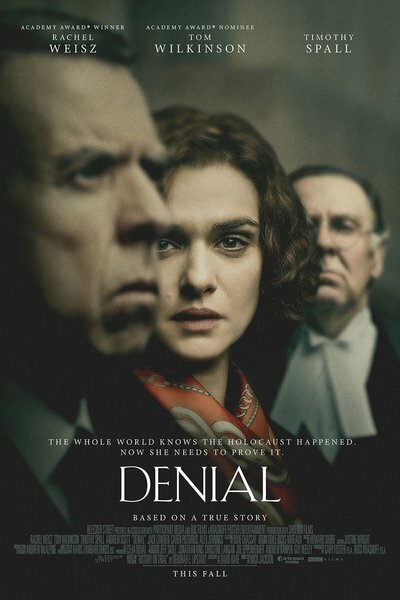 Recommended overall, Denial opens this Friday (9/30) at the Angelika Film Center downtown and the AMC Lincoln Square uptown.